What do you do after making ALL the competitive multiplayer modes and maps in Battleborn completely free? Release another free mode with new maps! We took our favorite PVP modes and smashed them together to create Supercharge. Start with the best parts of Meltdown, combine that with Capture, and mix well. The results: A whole new, fast-paced experience for smaller squads. Read on and learn how it works before you jump in. WHEN: Supercharge Mode arrives on all platforms at 12pm PT/ 3pm ET today, Thursday, June 22, 2017. Like Meltdown, the goal of Supercharge is to earn APPEASEMENT POINTS from MINREC – the robotic god of minion destruction – but with a new twist: now teams can sweeten their minion waves by fighting to control a single capture point. The team that owns the capture point “supercharges” their minion wave, adding tougher minions and more opportunities for scoring points! 3v3! - Smaller teams mean that you need to closely coordinate to get those minions to where MINREC wants them, while preventing the enemy team from doing the same. You’ll be doing more…and you’ll need to be a whole lot quicker. New Maps! - Play on three brand new maps created and sized specifically for Supercharge: Ziggurat, Permafrost, and Horizon. These tightened-up battlefields will make those 3-on-3 fights even crazier. Because the Supercharge matches are 3v3, plan for a LOT of coordination with your teammates. Supercharge has a large abundance of shards available throughout the match, as well as faster than normal large shard cluster respawns and - new to multiplayer - exploding barrels that drop shards as well. Veteran players: There’s a large abundance of shards readily available, so go into matches with higher end gear than what you are used to and be ready to use ‘em! Capturing the Supercharge pad in the center of the map grants your team a boost in its minion spawn waves by adding an additional Shepard bot. This can provide your team and minions with overshield buffs – so race for the center! In the center of every map is a MX.Elite Bot buildable that, when purchased, will walk towards your team’s lane and - if it makes its way to the grinder - your team will earn huge chunk of points and help change the tide of battle. We’ve made competitive multiplayer completely free. We’ve added another new mode and maps. We’ve got a whole story campaign for you to play in the full game. 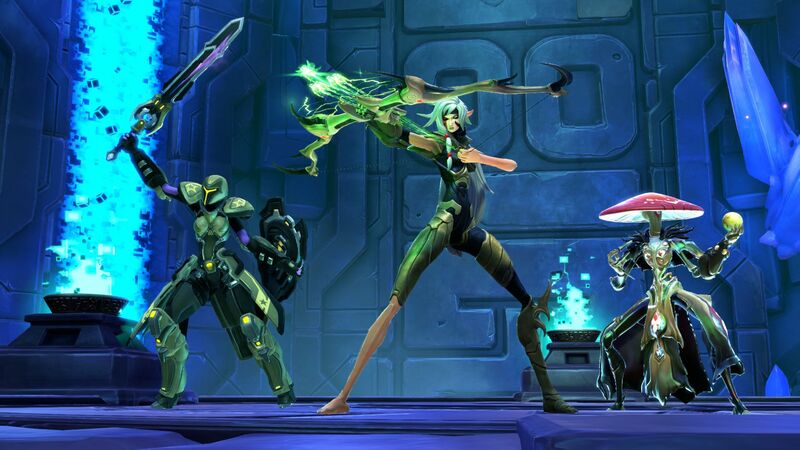 Now’s your chance to step into one of 30 Battleborn heroes’ shoes (or claws) and fight to save the last star! Check it out today on PC, Playstation 4 and Xbox One!